I had planned to do a post today about this amazing salted caramel hot chocolate with tequila that I created last week but decided to save that for next week; my ode to the perfect Valentine’s cocktail perhaps? Besides, the ‘big’ game is Sunday and I decided it might be more fitting to add another cocktail to the mix that would be game day appropriate. 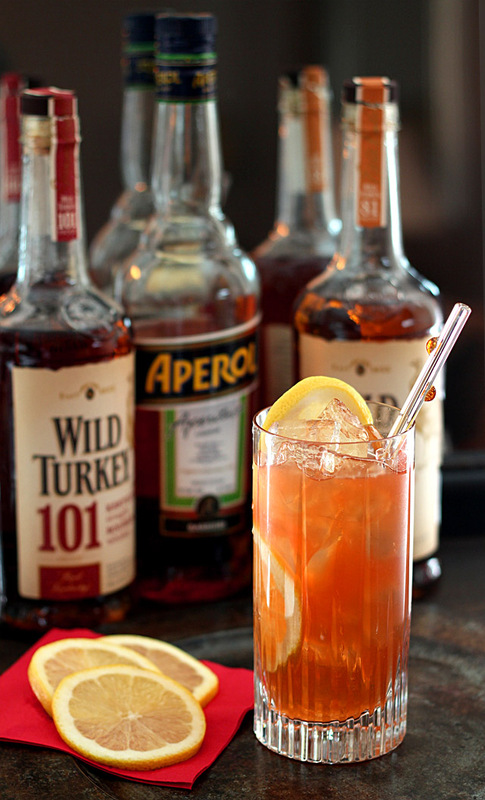 Or in my case; home is finally on the market and I’ll be elsewhere it seems so strangers can walk through my house…yes, that calls for a bit stronger libation for sure and this Wild Turkey, Aperol and Maple Syrup Cocktail fit the bill! As often as I extol the virtues of baking with Bourbon; it might not be quite so clear how much I also love sipping it; though always in a cocktail as I’ve never been one to enjoy much booze simply ‘on the rocks.’ When the folks with Wild Turkey asked if I would like to mix one of their new cocktails for my Friday Cocktail series, I was all over this one. It’s no secret I love Aperol (sort of a mild mannered Campari) and I could imagine it with the sweetness of bourbon but the coup de grace? Maple syrup? Why yes, yes I think I would please. Given a couple of choices, this one was the most appealing but I hesitated to suggest to readers a cocktail that would require two different bottles of this brand…so though they are unique in their own way, if given the choice of choosing just one? 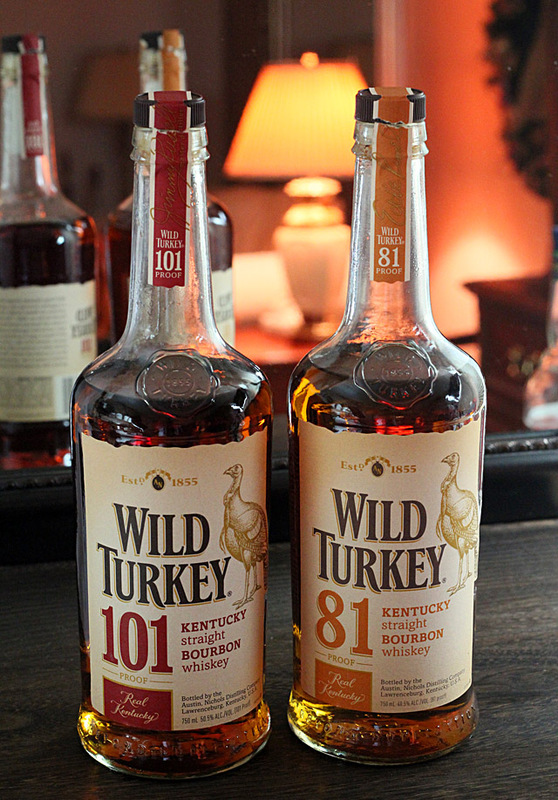 Go with the Wild Turkey 81; the newest member of the Wild Turkey family. It uses Wild Turkey’s famous high-rye mash bill for a spicy kick and is aged longer than others in the category; primarily 6-8 years in hand-selected American oak barrels from the Ozark Mountains. The barrels give Wild Turkey 81 the vanilla and caramel smoothness that marks it as real Wild Turkey bourbon. 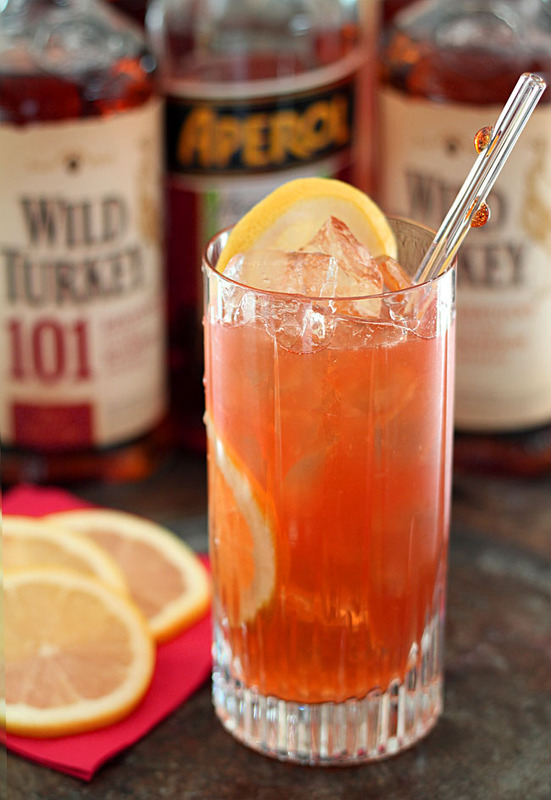 Wild Turkey 81 stands on its own, but really shines in mixed drinks where its robust flavors never shy away. Combining the Wild Turkey 81 with the 101 made for a terrific cocktail. Wild Turkey 101 Bourbon includes at least 51% corn, along with rye and malted barley. Crystal-clear, limestone-purified water from the distillery property is used throughout the process. It is aged in new deep-charred barrels made with white oak for the same Ozark Mountains. Considered the benchmark of bourbon; this is what real bourbon should taste like with vanilla, a taste of caramel, and notes of honey, brown sugar, with a hint of tobacco. Maybe I’ll just combine the two together in a bottle and call it my own personal stash of Wild Turkey 91!! I’ll be honest, this is a potent mix; the aroma alone is absolutely intoxicating and the drink even more so. Be careful out there! Last week I suggested a Tom Collins as a great party drink and I have to say, this one also measures up as another easy and delicious cocktail for a party. If you’ve not tried Aperol; this is a great opportunity to go International…mingling Italy and Kentucky together while watching an All American tradition! While I like to think of Aperol as Campari Light, I have to tell you this cocktail was anything but. Whoa!! So good…such a great blend of whiskey with that vanilla and caramel undertones combined with a hint of orange and maple to boot. I loved it…but love one of them; they have quite the kick! Lest I forget? Go Broncos 49’ers! Combine all ingredients in a cocktail shaker with ice and shake vigorously. Pour into a highball glass filled with ice and garnish with lemon slices. I doubled what I thought would be enough for two cocktails...but not really. Maybe my glasses were too large but it took about 3/4 of the mixture for two to fill my ice filled glass for one...just a heads up. Size does matter. ? Thanks for using our straw- makes a beautiful addtition! I love them…I’ve had several friends buy them too! Great looking cocktail. Congrats on the house being on the market! Keeping my fingers crossed for a good buyer to find it soon and for you to find your new home just as soon. Wild Turkey 101 is nice stuff. They also make a superb rye. Love the maple syrup in this cocktail – good touch. Fun drink – thanks. I can almost taste this cocktail – and after this week, I could definitely go for one of these! Congrats on getting the house up on the market – that is a huge project so I think you have more than earned one of these – cheers!!! I could use one now…out all day yesterday with the house full of strangers and looks like same today. The strangest feeling…I need a drink! I had a bad experience with Wild Turkey back in 84 during an elk cutting/processing party. I ended slow dancing with my buddy’s golden retriever to Leonard Sly records. Needless to say, have not had any since. For Supper Bowl Sunday we usually have bloody mary’s and mimosa’s. Well now that made me chuckle! Blood Mary’s and Mimosa’s? Wow, you guys start EARLY!! This looks like a great drink for a party! I can’t remember trying Wild Turkey but will look for it the next time I am in the liquor store. Just found out that I am hosting our neighbors for the Superbowl this weekend so I guess I’d better get a menu started.